There is much being said and to be said about President Obama’s decision to send US military forces to do whatever it is they are doing in Libya. Some of this commentary is even noting that there is something in the Constitution about going to war, even citing Section 8 of Article 1 which vests in Congress the power “To declare War.” Since the last time the United States declared war was 1941, most Americans have no recollection of Congress actually doing this. However, all living Americans have very real knowledge of the United States being at war, for we have been almost continuously involved in military action from the end of the last declared war (World War Two) to the current moment. How is it that we have been at war for six decades without any declaration of war? Since the 1950s this clear arrangement has broken down and the situation has become very murky. As noted, Presidents have claimed the power to launch operations on their own authority. Sometimes they solicited vague authorizations from Congress short of a formal declaration of war, such as the Gulf of Tonkin resolution which Lyndon Johnson used to expand the US involvement in Vietnam, or the resolution which George W. Bush used to invade Iraq and Afghanistan. When the Presidents do not bother consulting the Congress, the Congress has acquiesced by not taking any action to stop the President and continuing to authorize appropriations to fund the actions. Once, in 1972, Congress did push back by passing the War Powers Resolution. This requires the President to notify Congress of the commencement of a military action, and then get a congressional approval within 60 days. Most scholars consider the War Powers Resolution to be fairly ineffectual in restoring congressional priority in decisions to go to war. Even so, Richard Nixon vetoed it (it was passed by more than the two-thirds of Congress needed to override the veto) and every President since has rejected its attempt to limit their power to commence military action. Despite his statements in support of the War Powers Resolution when he was a Senator, President Obama now appears to be as willing to reject it as have all of his recent predecessors. My purpose here is not to comment on the wisdom of any of our military engagements since 1945, including the current exercise in Libya. My concern is deeper. I believe in the wisdom of the separation of powers in the Constitution. Governments possess no power more terrible than the ability to go to war. The Framers felt that no single officer of the government, even the President, should have the power to go to war on his sole and exclusive authority. We have lost sight of that fundamental principle, and as a result 80,000 Americans have died in wars launched contrary to the requirements of the Constitution. Of course, supporters of presidential war powers have responses to this. They say that modern warfare is murkier and faster than in the times of the founding. In our times, there is not enough time for a debate in Congress. I am willing to concede that modern circumstances are different. However, is that sufficient justification for a de facto amendment of the original constitutional arrangement? Is this simply another example of the concept of the “living Constitution”? This philosophy basically says that elements of the federal government can change the constitutional allocation of powers to adjust to modern conditions without a formal amendment to the Constitution if they can get away with it. Despite the fact that many so-called conservatives have supported this shift in the war-making powers, if we are going to respect the Constitution and the rule of law, we must reject this interpretation just as vigorously as we do other modern distortions of the Constitution. So how do we deal with the changed modern conditions of war? 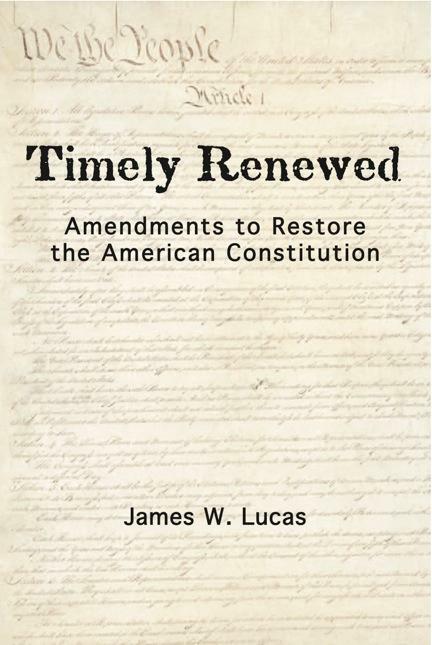 In chapter 7 of Timely Renewed, I propose an amendment which moves the requirement of congressional approval back to a point where proper congressional deliberation is still possible. This is before US forces are even sent overseas. The amendment would require a distinct congressional approval for any deployment of US forces outside of US territory, and further require that that approval be renewed every two years or else the troops have to be brought home. Not only will this restore the Congress’ original constitutional authority to make the basic policy decision about our foreign wars, but also force us to review our far-flung worldwide military operations in an era of massive budget deficits.